For about 30 minutes on the morning of February 27, 1982, the San Onofre Unit 1 reactor in California lacked cooling water for its emergency equipment. Typically, two separate loops are available to supply cooling water to remove heat from the air conditioning units for the control room and containment, as well as for the engines of the emergency diesel generators, and other vital equipment. One of the cooling loops is in service at all times – both under normal operating conditions and in the event of an accident – to remove heat from safety equipment, like the control room air conditioning unit. Under normal conditions, either loop is capable of supplying cooling water to all essential safety equipment during an accident. This was far from a normal day. Workers repairing a pump in one of the two cooling loops started the problem. At San Onofre, the pumps pulled salt water from the Pacific Ocean and sent it through the cooling loops. The warmed ocean water was then discharged back into the Pacific. The two pumps were in a concrete building at the shoreline. To repair the pump requiring maintenance, workers unbolted it from its pedestal mounted in the concrete floor of the building. They used a crane to lift the pump up, up, and away – leaving a hole in the floor where the pump had been. Water flowed into the building through the opening in the floor created by the pump’s removal. The flooding stopped when the water level was five feet above the floor. It stopped at that point because it matched the sea level outside the building. Shortly after the flooding began, operators in the control room noticed that the motor current for the operating cooling water pump – also located in the flooded building – was fluctuating. Fearing that the rising water would submerge and disable the pump’s motor, the operators turned the pump off. 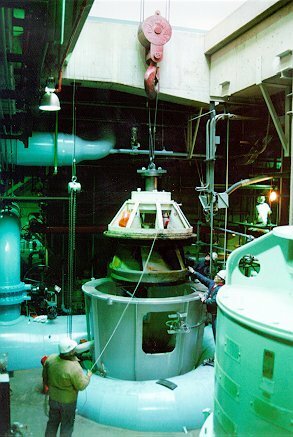 That left San Onofre without cooling water for vital safety equipment – one pump was suspended from a crane while the other pump was turned off for its own protection. Workers reacted quickly to the flood. They brought a portable pump into the flooded building to pump the Pacific Ocean water back into the Pacific Ocean. Initially, this measure was not too successful because the hole in the floor allowed sea water into the building faster than the little portable pump could return it. But workers lowered the big pump back into the hole and partially remounted it on the pedestal to slow the flooding rate. As the water level gradually dropped, workers jury-rigged a third pump and restored cooling water flow 24 minutes after the operators stopped the normal pump. The normal pump itself was placed back into service about 4 ½ hours later. When the seaweed settled, an investigative team determined that the maintenance foreman made an error estimating the tides that day. He intended to start the work when the sea level was below the floor of the building containing the pump, and with the tide going out. He apparently miscalculated. What causes the Pacific Ocean tide to rise and fall? The gravitational pull of the moon. Thus, the moon was ultimately responsible for this incident. It’s not uncommon for the best laid plans to encounter problems. Hence, even best laid plans should have best laid backup plans. At San Onofre, workers responded with ad hoc measures to cope with the unexpected flooding. Removing the pump from its pedestal created the potential for flooding. Even if the tide had been going out as planned when the job began, a delay in restoring the pump to its original configuration could have caused flooding when the tide came back. Given the increased potential for flooding when the pump was removed, it would have been prudent to pre-plan measures to be taken to protect against flooding. Best laid plans need to include contingency plans if the work takes longer than anticipated or if the plant’s operating condition changes during the work. Contingency planning can keep the best laid plan from becoming the best waylaid plan.